Prime Minister Narendra Modi wants India to be a magnet for new companies. Hong Kong and Singapore have similar hopes. Politicians have long struggled to emulate Silicon Valley. The spreading government ambition is another measure of runaway enthusiasm for technology. 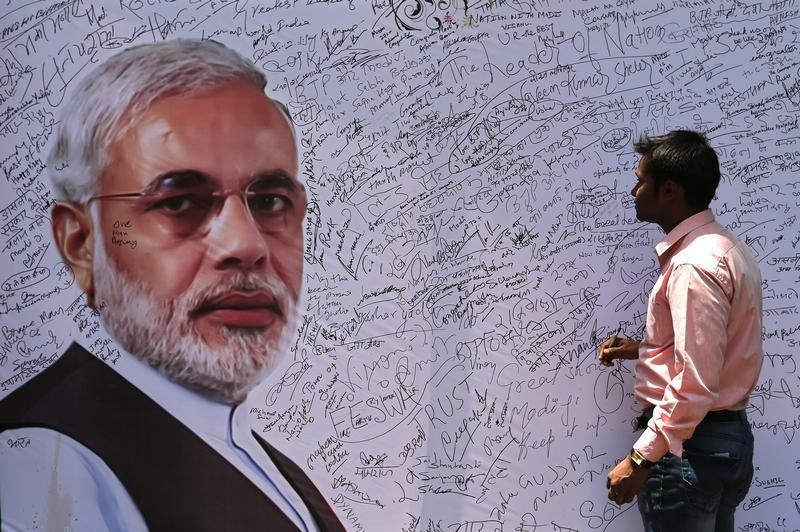 A man prepares to sign on a signature board with a picture Narendra Modi, the prime ministerial candidate for India's Bharatiya Janata Party (BJP). India will announce comprehensive plans to turn the country into a startup hub on Jan. 16. “Can India become a ‘Start-up Capital’? Can our states work together for new Start-ups for youth, and encourage innovations with start-ups, be it in the manufacturing sector, service sector or agriculture.” Prime Minister Narendra Modi said on Dec. 27 in his monthly “Mann ki Baat” address on All India Radio. Travis Kalanick, founder of ride-hailing app Uber, will be present at the launch of the so-called “Start-up India, Stand-up in India” initiative later this month, the Silicon Valley firm said on Jan. 6.